Season your chicken with salt and pepper and set aside for about 15 minutes. In a large pot (or wok! ), heat your oil over medium heat. Then add in your onion, garlic, ginger and chilies. Sauté for about 10 – 15 minutes, until the onions begin to soften and get golden. While the above are cooking, make your curry paste: mix together your dried spices (chili powder through garam masala) and mix with a little bit of water (maybe 2 – 3 tbsp?) to make a paste. When your onions are softened, add in this paste and fry it off for about 2 minutes. Then add in your cubed chicken, and cook for an additional 2 – 3 minutes. Add in your coconut milk and your fresh mint leaves plus some salt. Stir well, bring to a simmer, then cover and cook over medium heat for about 10 minutes. Remove lid and add in your diced pineapple + juice and let cook for another few minutes until chicken is cooked all the way through and pineapple flavor has had a chance to mingle with the rest of the curry. Simmer until sauce is to your desired thickness, then serve over rice. It’s really as simple as that! As you can see, even making your own paste from scratch doesn’t add to the time or difficulty of the dish, and likely won’t require a special trip to the spice aisle. Any spices you do need to pick up can easily be used in other dishes and are staple for many other Asian dishes, so are well worth having on hand. 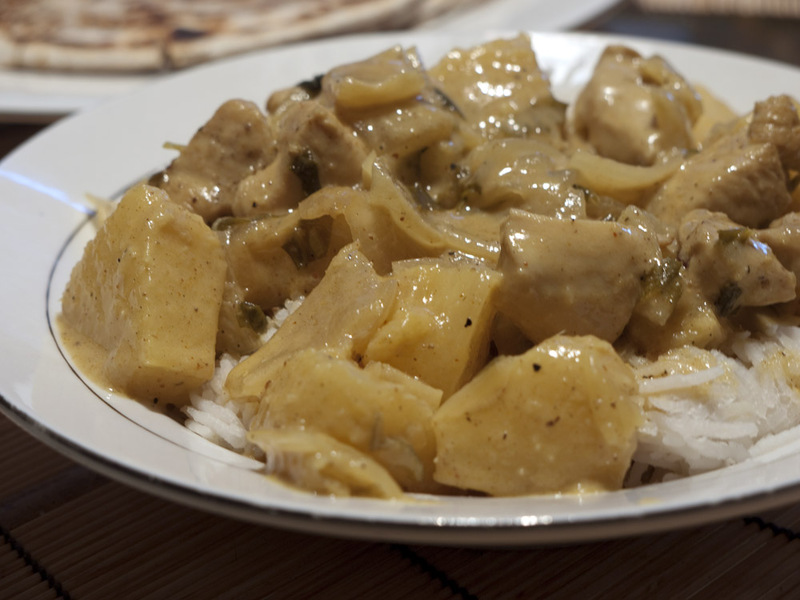 This curry was rich and creamy, with a great balance between sweetness and heat. It had a nice coconut flavor, but the dish was by no means overpowered by that one flavor. The first night I made this, I actually toasted some sesame seeds in a pan just before serving and sprinkled each portion with them, which added a nice nuttiness as well. I felt like I had successfully recreated a Thai dish that tasted the way I hoped it would, and all for about $10 total, which works out to only $2.50/serving or so… a far cry from the $14 or so we’d pay at our local Thai place! It's incredibly versatile because by changing the amount of chilies, you can make it as mild or as spicy as you like. It's also a nice beginner dish for those who may not be curry fans, as the flavors are fairly subtle and not intimidating at all. And of course, as with all curries, this one only gets better after a day or two in the fridge so that the flavors fully integrate, meaning it’s perfect for leftovers. With the school year starting up, this is something you could easily cook up on the weekend (it only takes about 30 minutes from start to finish) and then eat happily throughout the week. Of course, the non carnivores amongst us should feel free to substitute in tofu in place of the chicken for an equally satisfying meal. Give it a try and let me know what you think! The only curries I have actually made at home have come from a pre-made paste that you add coconut milk and fish sauce to, and while I love them, they just don’t compare to the curries I can get at my favorite Thai place. They actually have something similar on their menu, but use duck instead of chicken. 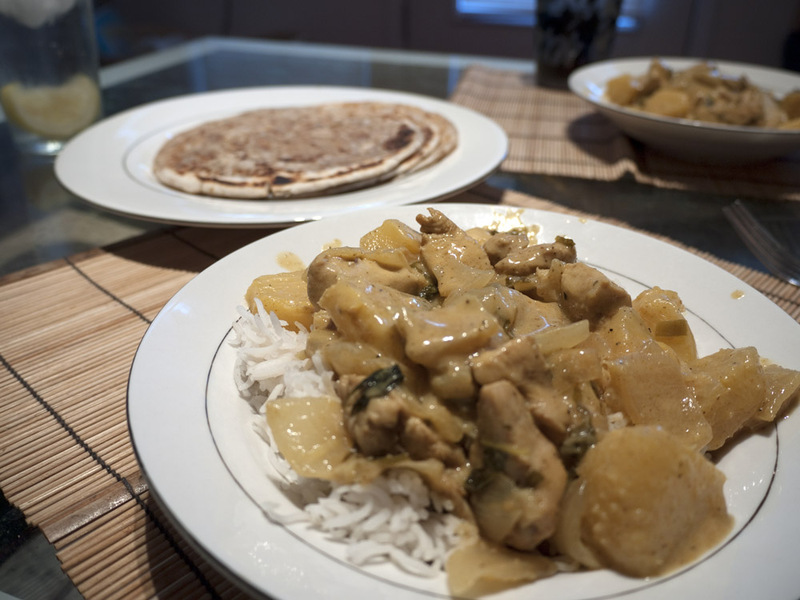 I am going to have to try this because you mention that it’s pretty quick and easy, and curries are probably the only international meal that everyone in my family will eat. I also like the idea of the toasted sesame seeds on top! This would also be a great reheated lunch for when I bored by the same old thing. Thanks so much for sharing this recipe! @ zibilee: Yes, our local Thai place does this curry with duck as well, but I figured chicken would be just as good and probably a lot easier to prep! 😉 I have yet to tackle duck at home, though I’m sure that day will come! Another good substitute for chicken if you’re feeling like a change would be shrimp! Hmmm yum! I’m a huge curry fan who doesn’t have enough knowledge to make it from scratch. I have bought Thai red curry paste in Asian market. Your recipe is highly feasible as the ingredients are easy to gather. I’m going to try this out! @ Matt: Yes, I just recently ventured into the world of making my own curry bases, and I’ve actually had a lot of success. Thankfully this one doesn’t call for anything weird or difficult to get (apparently in Nashville at least, kaffir lime leaves are prohibited, for instance), and it tasted spot on! I hope you like it!